NEW VIDEO!!! This gigantic salad is not only beautiful, but it is completely packed with delicious, flavorful ingredients that are amazing all piled in together! 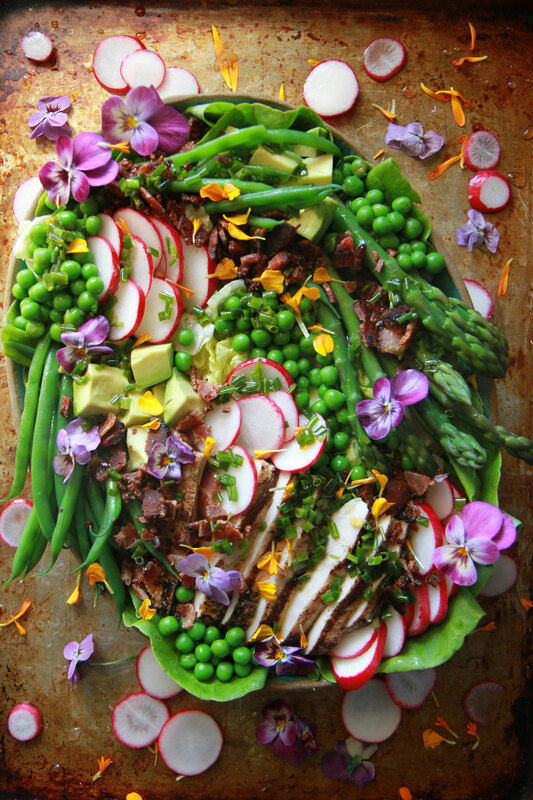 It’s basically the best of Spring produce in a huge awesome salad with bacon confetti…. I am so excited to be fully into Spring here in Seattle right now- we are having EPIC weather this week, with temperatures in the 70’s and we basically all hardly know what to do with ourselves. The girls and I have been spending lots of rainy weekends bingeing on Netflix (our current faves have been Zumbo’s Just desserts, an Australian baking show and the new Chef’s Table season which is all Pastry Chef’s and totally gorgeous.) But, the sun is prying us away from the couch where there is basically a mold of our rear ends from the winter. We planted lettuce, kale and lots of new herbs in the garden yesterday and radishes, cucumbers, zucchini and carrots are coming later this week. Basically we are all pumped up about Spring and all of the healthy inspiration that is going to be happening from our garden very soon! So, I thought that there was no better time to share this recipe with you! 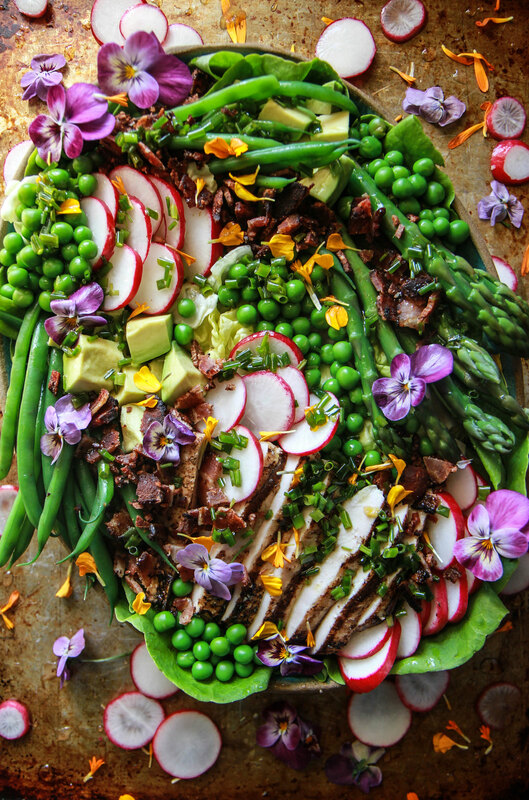 I am taking a classic Cobb Salad (minus the blue cheese and eggs because of allergies) and adding all of the most delicious Spring produce like asparagus, green beans, peas and fresh, crispy radishes! The result is so beautiful and really delicious, and I know you are going to love it! On a platter, arrange all of the salad ingredients. In a small bowl, whisk all of the ingredients together and season to taste with kosher salt. Drizzle the vinaigrette over the salad and toss to combine, serve immediately. Love the new video, Heather! And this salad is right up my alley! Cobb salads have never appealed to me because I’m an egg hater (I know, I know), but THIS without the egg is perfection. My mouth is watering! That’s a GORGEOUS salad! And I love me some confetti bacon hehe!!! Hooray for spring and bacon confetti!! It does not get more gorgeous than this salad!!!!!!! I made this salad & am eating it right now. This recipe is delicious! Like the picture, as vegan I like the salad .